An unmanned Falcon 9 rocket, carrying more than two tons of supplies for the International Space Station, exploded shortly after lifting off at 10.21am Eastern Time from Cape Canaveral. "The vehicle experienced an anomaly on ascent," SpaceX tweeted. The company, which is owned by billionaire entrepreneur Elon Musk, said it was putting together an “anomaly team” to determine the cause of failure, which occurred "shortly before the first stage shutdown." "There was an overpressure event in the upper stage liquid oxygen tank. Data suggests counterintuitive cause," elaborated Musk in a later tweet. "That's all we can say with confidence right now. Will have more to say following a thorough fault tree analysis." 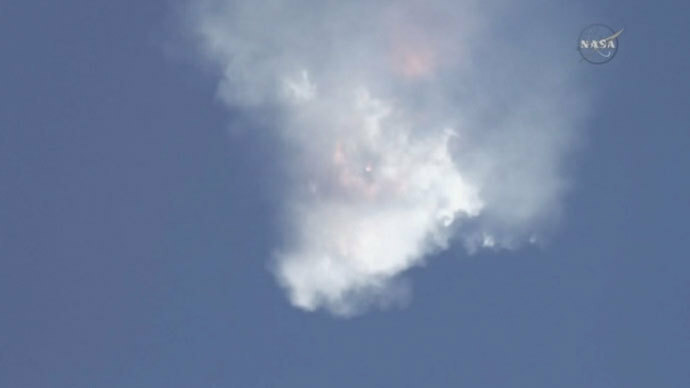 NASA said they do not blame SpaceX for the failure, and trusted the company to determine the reasons for the crash. “SpaceX has demonstrated extraordinary capabilities in its cargo resupply missions to the station, and we know they can replicate that success. We will work withm and support SpaceX to assess what happened,” said NASA Administrator Charles Bolden in a statement. The mid-sized Falcon 9 has experienced only one partially failed launch in 2012, and in the past three years has delivered six cargoes to the ISS under its $1.6-billion NASA contract. The lost payload comprised 2,477 kg of food, clothes, and materials for onboard experiments. The International Space Station, which is currently operating with a skeleton crew of three, has been plagued by poor deliveries in the past months.A US mission failed last October, when the delivery vehicle exploded on the launchpad, and a Russian Progress freighterfailed to connectwith the space station after reaching orbit. Russia will launch another mission on Friday from the Baikonur cosmodrome in Kazakhstan, with Russia's space industry sources saying the accident would have no bearing on the new Progress plans. Most of the attention before the Falcon 9 launch was focused on SpaceX’s attempts to land the Falcon 9’s reusable first rocket stage on its drone platform floating off the coast of Florida. The previous two attempts this year ended up in spectacular near-misses.